Air Combat Biplane Rides are exciting! Our ex-military pilots offer exclusive airplane rides to the adventurer. Learn about biplanes, aerial tactics and enjoy an opportunity to fly those maneuvers against another biplane. Experience what air combat was like for the World War 1 Aviator. Call us! 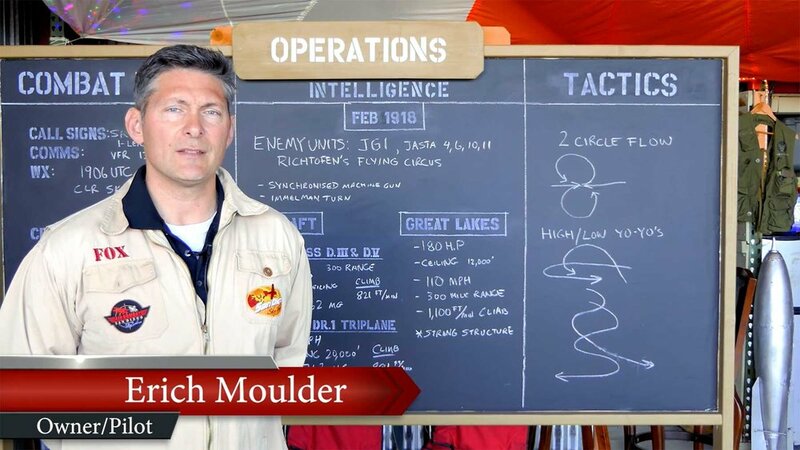 What was it like to be a WWI fighter pilot? Experience first hand the excitement, thrills and military experience in beautiful San Diego. 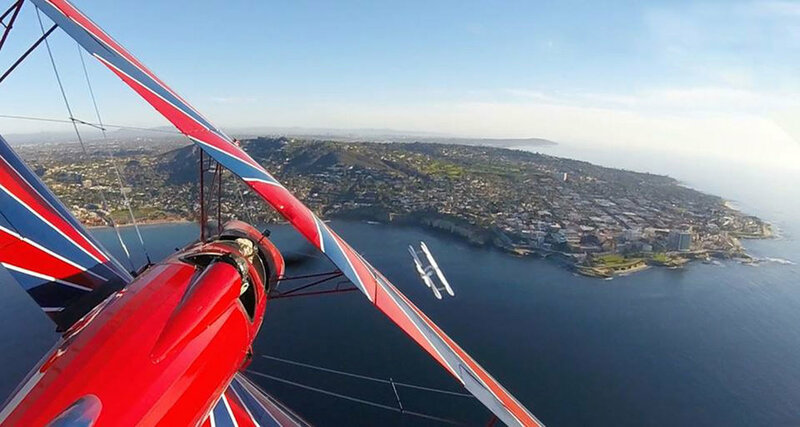 You will fly in a vintage open cockpit aircraft and duel with an adversary biplane while experiencing the beauty of San Diego. Perfect for a couples afternoon adventure or a gift package for that adventuresome friend. Only $529 per person. Maverick flies against Navy Pilot 'Arch' in a biplane dogfight. Maverick and Tasha dueled it out in the sky. They loved their biplane rides. 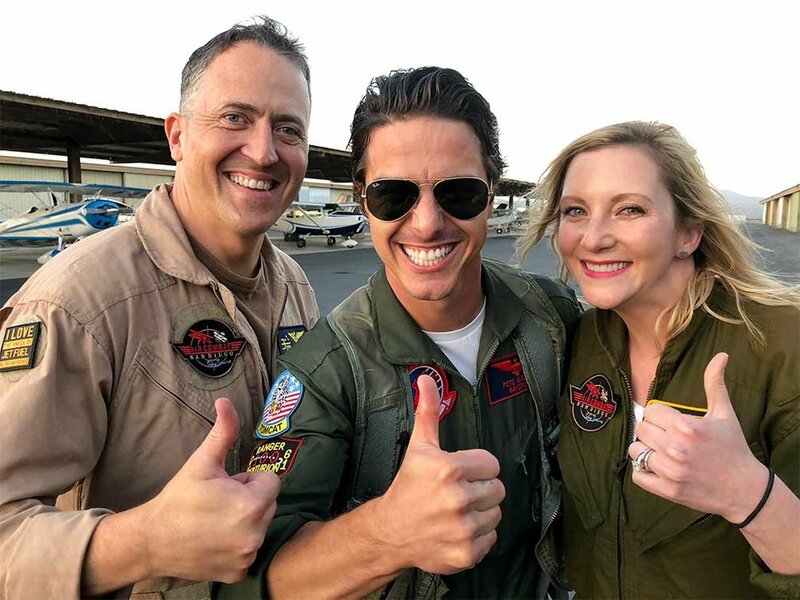 Top Gun Experiences! Located between Miramar (home of Top Gun) and downtown San Diego, we offer super easy access, extraordinary Navy/Marine Air Combat pilots, and the best views / experiences of your life. Our pilots are true aviation experts and want to share the experience with you. The most amazing airplane ride ever! Competitive, education, unique and fun! No ordinary biplane or airplane ride. The San Diego Sky Tours vintage hangar is a great place for team members to socialize and hangout in between flights. Our pilot staff can work with the Group organizers to get snacks, lunch and beverages for your crowd. Heavily discounted aerial tours and biplane flights for more than 3 persons can make for an exciting day. Call us for more information. We can schedule Maverick to show if available. 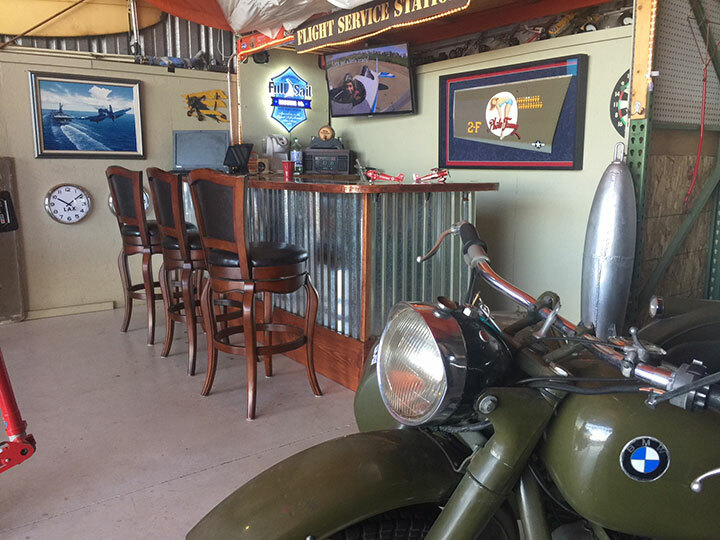 A vintage hangar pilot bar which is great fun for groups of 20- 30 persons to wait and socialize before and during biplane rides. Team building in the Sky. Add a little bit of excitement and whole lot of fun, you get a great bonding and training experience that you will ALWAYS remember. An informative military brief in our briefing room, discussing Air Combat tactics such as BFM, Yo-Yo's, flat scissors and lead, lag, pursuit. FAA Safety Brief is included. GoPro camera's will be available as an option. Flight instruction from our Instructor Pilots teaching the basics of BFM. 50-minute to 1 hour Air Combat flight mission over San Diego. Beach tour included. Track your TARGET like the Blue Max! Nothing beats this flight. Open cockpit, yanking and banking! RTB (return to base) and sit back in our lounge and relish the moment. 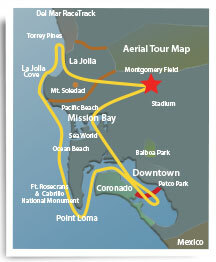 Our San Diego Sky Service facility is located less that 7 miles from the legendary location of TOP GUN. Call us, come visit and experience San Diego from the sky! Pilot Jeff just finishes an air combat biplane ride with Maverick!